Harmouche Plans to be a Dentist; Gantela Completes Goal to Attain a Ph.D. This semester, NSM had the rare distinction of having the University of Houston’s youngest and oldest graduates. 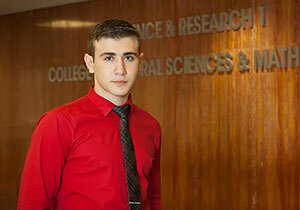 Omar Harmouche, 18, completed his bachelor’s degree in biology and plans to go to dental school. Christopher Gantela, 78, completed his Ph.D. in geophysics after a long career as a geophysicist. Both graduates participated in NSM’s Convocation held May 14 in Hofheinz Pavilion. They were also recognized at the University-wide Commencement. Omar Harmouche plans to go to dental school next year. At 18, he is UH’s youngest grad. He moved to Houston from Lebanon when he was 11 years old and attended Clear Horizons Early College High School. A biology major and chemistry minor, Harmouche participated in undergraduate research through the Provost’s Undergraduate Research Scholarship and the Summer Undergraduate Research Fellowship. For both programs, he worked in the lab of Gregg Roman, associate professor of biology and biochemistry, on research to uncover the gene for apathy. Harmouche tutored in the American Chemical Society Tutoring Center and also did internships and shadowing with physicians and dentists. He hopes to have the best of both professions by becoming a dental surgeon. At 78, Gantela is finishing a journey that began in 1961. He had just completed a M.Sc. 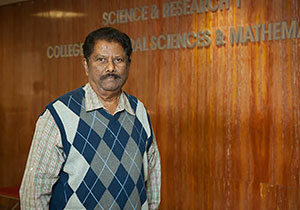 in geology at Osmania University in India and planned to complete his Ph.D. However, his mentor left the university, and his Ph.D. registration was cancelled. Not to be deterred, he moved to University of Saskatchewan in Canada to pursue a Ph.D. Again, fate stepped in, and he completed a M.Sc. in geophysics instead. His career took off, and over the years he worked as a geophysicist in Canada, Algeria, Syria, Saudi Arabia and the United States, developing an expertise in processing and programming. Gantela retired from Saudi Aramco in 1997 and moved to Houston to work. “At that point, I decided to pursue my Ph.D.,” Gantela said. Hua-wei Zhou, Gantela’s advisor and now department chair of earth and atmospheric sciences, encouraged him. “I quit working and started taking courses to refresh myself since I had been out of school for 40 years,” Gantela said. His dissertation covers work he completed on a project founded by Zhou, Dr. Stuart Hall and Dr. Tom Bjorklund, called the Los Angeles Region Seismic Experiment. Gantela analyzed seismic data off the coast of Los Angeles between Catalina and San Clemente Islands. Historically, the data had been difficult to analyze due to too much noise and not enough signal. Gantela and his colleagues have one paper on their findings accepted for publication. He will work on another publication after graduation. “My mother and father raised me to value education. I’ve never lost the desire to learn,” Gantela said.